Richard Hugh Blackmore (born 14 April 1945) is an English guitarist and songwriter.He was one of the founding members of Deep Purple in 1968, playing jam-style hard-rock music which mixed guitar riffs and organ sounds.During his solo career, he established the heavy metal band Rainbow which fused baroque music influences and elements of hard rock.Rainbow steadily moved to catchy pop-style mainstream rock.Later in life, he formed the traditional folk rock project, Blackmore's Night, transitioning to vocalist-centred sounds. As a member of Deep Purple, Blackmore was inducted into the Rock and Roll Hall of Fame in April 2016. Blackmore was born at Allendale Nursing Home in Weston-super-Mare, Somerset, as second son to Lewis J. Blackmore and Violet (née Short). The family moved to Heston, Middlesex, when Blackmore was two. He was 11 when he was given his first guitar by his father on certain conditions, including learning how to play properly, so he took classical guitar lessons for one year. In an interview with Sounds magazine in 1979, Blackmore said that he started the guitar because he wanted to be like Tommy Steele, who used to just jump around and play. Blackmore loathed school and hated his teachers. While at school, he participated in sports including the javelin. Blackmore left school at age 15 and started work as an apprentice radio mechanic at nearby Heathrow Airport. He took electric guitar lessons from session guitarist Big Jim Sullivan. In 1960 he began to work as a session player for Joe Meek's music productions, and performed in several bands. He was initially a member of the instrumental band The Outlaws, who played in both studio recordings and live concerts. Otherwise, in mainly studio recordings, he backed female singer Glenda Collins, German-born pop singer Heinz (playing on his top ten hit "Just Like Eddie", "Beating Of My Heart"), and others.Thereafter, in mainly live concerts, he backed horror-themed singer Screaming Lord Sutch, beat singer Neil Christian, and others. During the 1960s, Blackmore played a Gibson ES-335 but from 1970 he mainly played a Fender Stratocaster until he formed Blackmore's Night in 1997. The middle pick-up on his Stratocaster is screwed down and not used. Blackmore occasionally used a Fender Telecaster Thinline during recording sessions. He is also one of the first rock guitarists to use a "scalloped" fretboard which has a "U" shape between the frets. 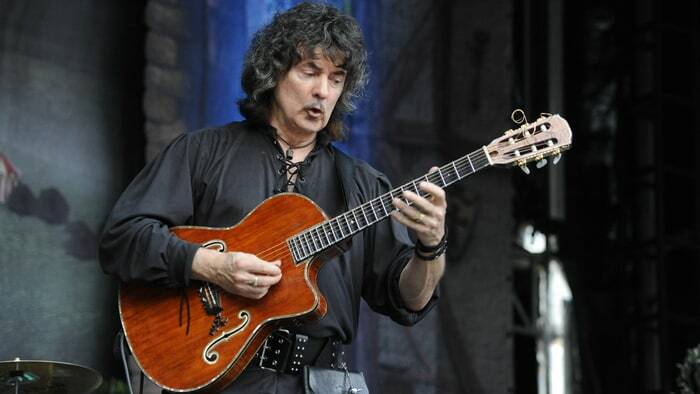 In his soloing, Blackmore combines blues scales and phrasing with dominant minor scales and ideas from European classical music. While playing he would often put the pick in his mouth, playing with his fingers. He occasionally uses the diatonic scale, with rapidly changing tonality. In the 1970s, Blackmore used a number of different Stratocasters; one of his main guitars was an Olympic white 1974 model with a rosewood fingerboard that was scalloped. Blackmore added a strap lock to the headstock of this guitar as a conversation piece to annoy and confuse people. His amplifiers were originally 200-Watt Marshall Major stacks which were modified by Marshall with an additional output stage (generated approximately 27Db) to make them sound more like Blackmore's favourite Vox AC30 amp cranked to full volume. Since 1994, he has used ENGL valve amps. Effects he used from 1970 to 1997, besides his usual tape echo, included a Hornby Skewes treble booster in the early days. Around late-1973, he experimented with an EMS Synthi Hi Fli guitar synthesizer. He sometimes used a wah-wah pedal and a variable control treble-booster for sustain, and Moog Taurus bass pedals were used in solo parts during concerts. He also had a modified Aiwa TP-1011 tape machine built to supply echo and delay effects; the tape deck was also used as a pre-amp. Other effects that Blackmore used were a Uni-Vibe, a Dallas Arbiter Fuzz Face and an Octave Divider. In the mid-1980s he experimented with Roland guitar synthesizers. A Roland GR-700 was seen on stage as late as 1995–96, later replaced with the GR-50. Blackmore has experimented with many different pick-ups in his Strats. In the early Rainbow era, they were still stock Fenders, later Dawk installed over wound, dipped, Fender pick-ups. He has also used Schecter F-500-Ts, Velvet Hammer "Red Rhodes", DiMarzio "HS-2", OBL "Black Label", Bill Lawrence L-450, XL-250 (bridge), L-250 (neck). In his signature stratocaster Seymour Duncan Quarter Pound Flat SSL-4's are used to emulate the Schecter Guitar Research F500ts and since the early 90s, he has used Lace Sensor (Gold) "noiseless" pick-ups. "the guitar is popular because there are talented people behind it and the guitar comes alive because of the combination of technique, style, feeling, and inspiration from the players"